contains the optimal combinations of different kinds of acid, rust preventing and cleaning agents. 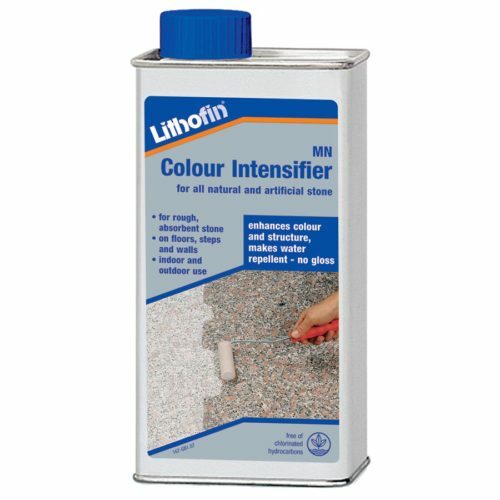 Lithofin MN Builders’ Clean dissolves and removes cement and mortar residues, efflorescences, limescale deposits, stubborn ingrained dirt, rust and rust discolourations. The yellowish discolouration which results from iron containing stones rusting is removed and largely prevented. 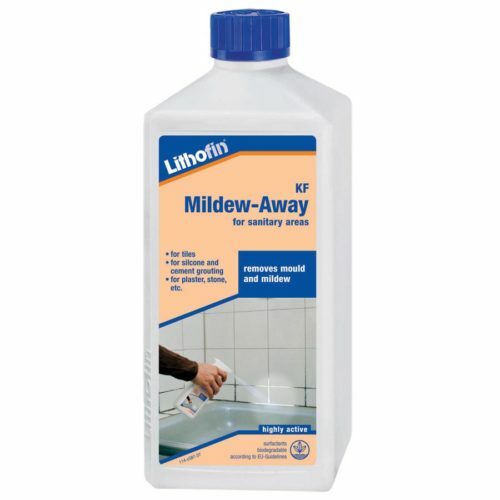 For removing cement residues from newly installed surfaces, for thoroughly cleaning used surfaces and for removing rust and rust discolourations. 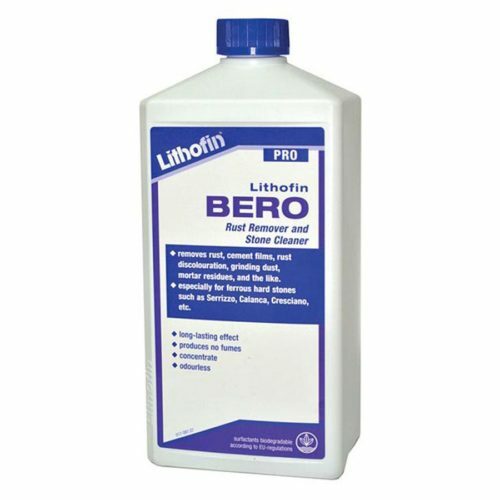 Lithofin MN Builders’ Clean prevents rust discolourations, which occasionally appear when cleaning iron containing stones such as serrizzo, cresciano, calanca, sardo white, etc. 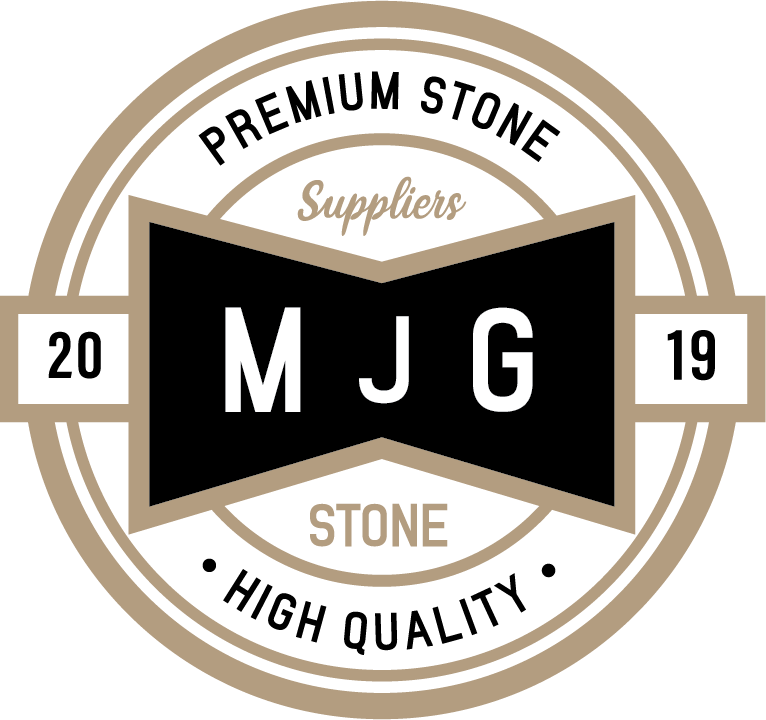 The product is therefore particularly suitable for those stones. Please Note: not suitable for polished and finely honed limestones (marble) and manufactured stones. Always try the product in an inconspicuous area prior to use, since especially blue and black “granites” are often damaged. 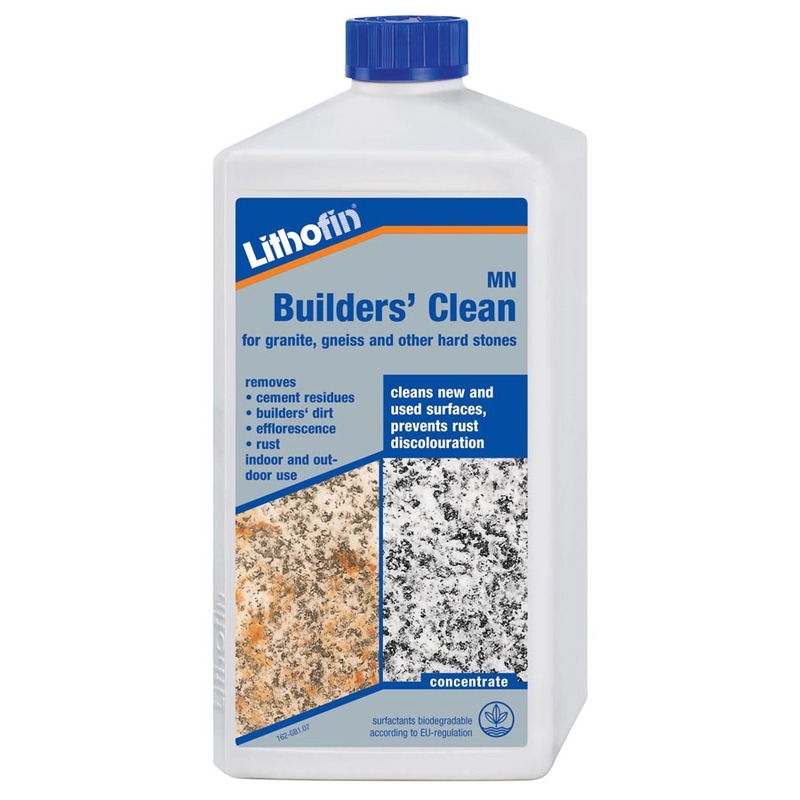 First wet the surface, then apply Lithofin MN Builder’s Clean – diluted with water up to 1:10, depending on the type of dirt – and immediately spread the product evenly on the surface with a scrubbing brush. After a few minutes, scrub the surface then wash away with clean water. Do not allow the product to dry on the surface. In stubborn cases this procedure may have to be repeated. acid such as limestone, marble, manufactured stone, etc. In cases of doubt, try the product in an inconspicuous area. Surfaces such as chrome, enamel, wood, and similar acid sensitive surface must be protected against splashes and vapours. Acid containing cleaners can develop vapours which may damage sensitive surfaces. We highly recommend carefully washing the product off the surface and ensuring good ventilation during and after use. approx. 15 to 30m² depending on dirt up to 50m² on polished surfaces. Many natural stones require a protective treatment which prevents the penetration of water, oil and dirt. The LITHOFIN-Range offers suitable special products. Closed, cool and dry. Shelf life of up to 5 years. Surfactants are biologically degradable in accordance with EU-regulations. Free of phosphates. The acidic components are largely neutralised during cleaning. Ingredients: hydrochloric acid (<10%); but-2-yne-1,4-diol (<10%); orthophosphoric acid (10% to 30%); auxiliary agents. Contains phosphoric acid. May be corrosive to metals. Causes severe skin burns and eye damage. Contains But-2- in-1,4-diol. May produce an allergic reaction. Keep out of reach of children. Keep only in original container. Wear protective gloves/protective clothing/eye protection/face protection. IF IN EYES: Rinse cautiously with water for several minutes. Remove contact lenses, if present and easy to do. Continue rinsing. Immediately call a POISON CENTER or doctor/physician. Store locked up.